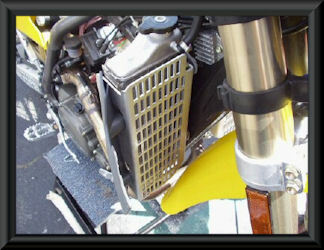 Radiator guards for 2003 - 2010 TC/TE/TXC/WR Husqvarna motorcycles. They will protect your fragile radiators from nasty front & side impacts. Constructed from 1/8" aluminum that is quick and easy to install. All of our radiator guards have rear mounting brackets for that extra support with all mounting hardware included. NOTE: For proper fitment on models equipped with a radiator fan, the right-hand side radiator guard must have the rear brace removed.